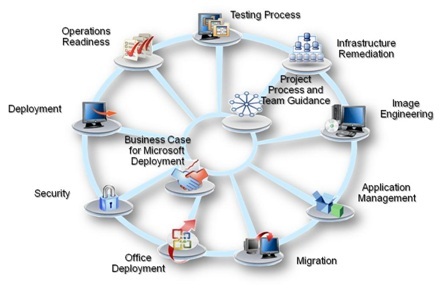 NEWS – Microsoft Deployment Toolkit 2010 Beta 2 Now Available! The Windows® 7 and Windows Server® 2008 R2 launches are just around the corner. As you prepare to deploy these operating systems, consider jumpstarting your project with Microsoft® Deployment Toolkit (MDT) 2010 Beta 2. Leverage this Solution Accelerator to achieve efficient, cost-effective deployment of Windows 7 and Windows Server 2008 R2. MDT 2010 is the next version of Microsoft Deployment Toolkit, a Solution Accelerator for operating system and application deployment. New features such as flexible driver management, optimized user interface workflow, and Windows PowerShell™ can simplify deployment and make your job easier. MDT 2010 will support deployment of Windows 7 and Windows Server 2008 R2 in addition to deployment of Windows Vista®, Windows Server 2008, Windows Server 2003, and Windows XP. Fully automated zero touch installation deployments by leveraging System Center Configuration Manager 2007 Service Pack 2 beta and Windows deployment tools. For those without a System Center Configuration Manager 2007 infrastructure, MDT leverages Windows deployment tools for lite touch installation deployments. Cmdlets can be used for importing content such as Drivers, Operating Systems, Task Sequences, etc. Microsoft Deployment Toolkit (MDT) 2010 Beta 2 is now available! Download the Microsoft Deployment Toolkit 2010 Beta 2 and give your feedback (Live ID login and registration required). If already a member, click here. Also check out other Solution Accelerators to help your Windows 7 and Windows Server 2008 R2 project including Microsoft Assessment and Planning Toolkit, Infrastructure Planning and Design Guides, and Windows Optimized Desktop Scenarios Solution Accelerator (with assessment tool and design guide).